After an extremely wet week in Austin due to Hurricane Alex, I ended up checking the hive today as the weekend was touch and go with a lot of cloud cover and chances of thunderstorms. The empty super I added last week in the 3rd position didn’t have as much comb drawn out as I would have hoped, but we did have a solid 3-4 days of rainy weather last week which prevented the girls from foraging. It looks like Alex has sputtered out, and the week ahead should be sunny. I’m most concerned with the 8-9 queen cells I found in the 2nd super which I removed. I’m really trying to prevent a swarm in my first year. 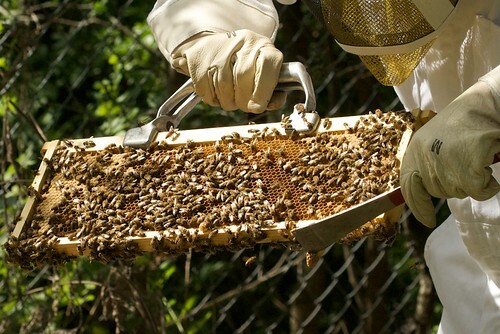 If I had the equipment on-hand, I could have attempted a split into another hive, but at this point, I’d rather keep Large Marge and her crew in one hive because the Texas summer is just going to get hotter, and there will be less flowering plants for a new hive to survive on. I’m hoping good weather will allow the empty 3rd super to be drawn out giving them them much needed space and eliminating the swarm instinct. Here is a frame with a queen cell. 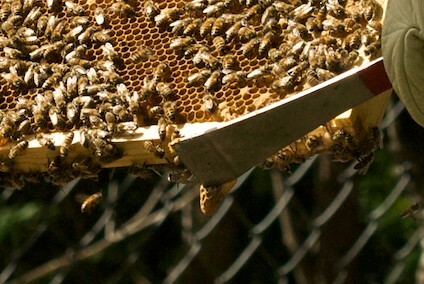 Close-up of the queen cell just under the hive tool. On the plus side, all queen cells for swarming are on the bottom of frames. Supercedure cells are usually built in the middle to upper part of the frame. These types of cells are created when the existing queen is either dead or not performing well. I can at least take comfort that Large Marge is still going strong which was confirmed by my inspection today where I saw plenty of eggs and larvae in various stages of development. The girls were a little more aggressive today which I’m chalking up to them being cooped up all week due to the rain. 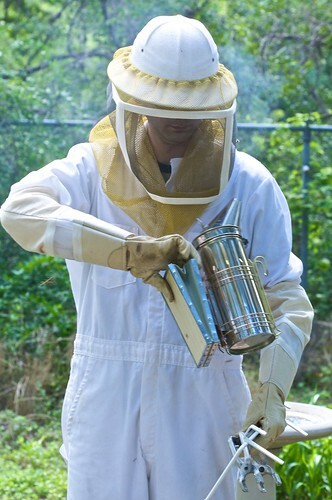 I had a few bees that continued to follow me around even after the hive was closed back up, and I ended up giving myself a few puffs of smoke to encourage them to go back to the hive.